MasterWeb Review 2019: Is MasterWeb a Good Hosting? Focusing on the Indonesian market, Masterweb.net is a reputable hosting company that provides stable web hosting services and dedicated servers optimized for performance. In operation since 1996, Masterweb is an Indonesian hosting provider that proudly claims to be the best in the country. They offer a range of hosting packages for individuals and businesses of all sizes, including cloud, VPS, and dedicated server packages for scalability. Currently, they serve over 100,000 local customers. Masterweb owns a number of servers both in Indonesia and abroad, all optimized for speed and performance. They own high-grade hardware powered by Intel and AMD and use software from trusted vendors, including an in-house control panel that was designed with user privacy and security in mind. With round-the-clock monitoring and multiple data backups, you’re assured of minimum downtime. As Google Indonesia’s Premium SME partner, Masterweb has developed a system to help small to mid-sized businesses get their websites up and running quickly — and get more traffic while they’re at it. To that end, they have entry-level shared hosting packages that start customers out with a free domain, 2GB storage, and unlimited data transfer and emails — though this requires a minimum one-year contract length. Masterweb also has a number of shared hosting plans for larger businesses and e-commerce websites. The Excited Plan, which is their basic package, comes with 25GB storage and a minimum contract of 6 months. The Success plan comes with 100 GB storage, while the Titanium plan offers you unlimited storage space for your website. With the Titanium plan, you also get unlimited databases and emails, and the minimum contract length is down to a single month. But that’s not all: the three Business shared hosting plans also include free setup, unlimited POP3 accounts, unlimited email forwarders, and your choice of Plesk or cPanel. You also get a free domain for the entire lifetime of your hosting contract. If you’re in need of extra resources or processing power for your business, you should consider their VPS or cloud-based servers with unmetered bandwidth and the latest OS. They’re stable, scalable, and optimized for performance. They automatically switch between nodes to ensure minimum downtime and disruption. With their VPS hosting, you’ll also get an installation of their private and secure Virtualizor control panel and a free one-year domain registration. Unlike other hosting companies that schedule weekly backups, Masterweb does it daily. They back up three copies of your data and files on local hard drives and secure data centers in remote locations, so in the event of a disaster or server failure, you can always retrieve and restore all your original files and databases. Their website isn’t that great, but it’s functional and responsive. They have colorful and neatly organized comparison tables, so I didn’t have to spend much time comparing their shared hosting plans. 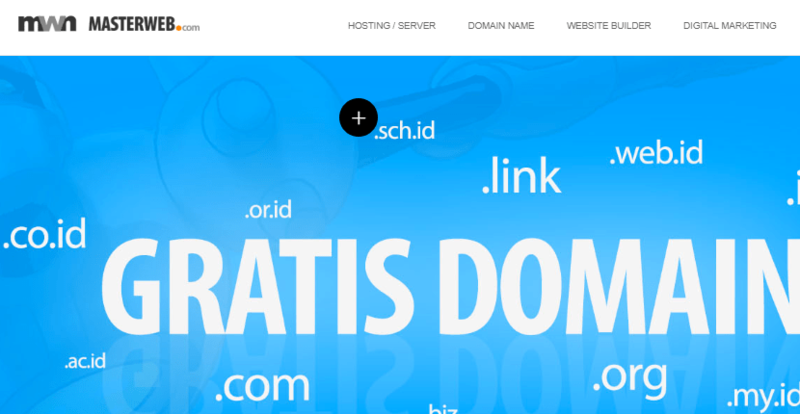 I wish they had an English website, but then again this is a hosting service that focuses solely on the Indonesian market. Masterweb’s extensive range of shared, cloud, VPS, and dedicated server packages are all within the market average. They even have a lite version of their shared hosting called the Smile plan, which affords you 1GB of space and unlimited data transfer at an extremely budget-friendly rate. This will appeal to individuals or small Indonesian startups that simply want to establish a basic online presence without having to spend too much. I’ve seen hosting services with a lengthy registration process. Masterweb keeps it simple with three steps. In fact, your account becomes active the moment you pay for your hosting package. It’s also easy to switch between plans and upgrade. The best part is that you don’t need to cancel anything to move to a higher level plan – and Masterweb offers a free migration service if you need to move your data off their shared hosting to one of their virtual servers, which means they really care about making your hosting experience a smooth one. I haven’t interacted much with their technical support team, but from the little I’ve experienced, they’re competent, honest, and helpful. Available 24/7, they can assist you with both technical matters and billing or payment issues. You can contact them via email, fax, telephone, or live chat. Masterweb.net offers stable hosting packages with powerful features and friendly customer support around the clock. Considering their reliable service and pocket-friendly rates, they’re worth a try. Wondering how MasterWeb stacks up against other Web Hosting companies? Enter any other Web Hosting company and we will give you a side-by-side comparison.